American Equus Chosen Rider, Taylor Zbytek, had no expectations of competing at the AQHA World Finals in 2017. After completing her race around the barrels in the Senior Horse division, Zbytek looked up to see her time was the winning round in the AQHA Level 2 World Championships. "The Elite stirrups have definitely helped me because I don't have to worry about my feet moving or losing my stirrups ever; I love them," commented Zbytek. American Equus Chosen Rider, Taylor Zbytek, had no expectations of competing at the AQHA World Finals in 2017. 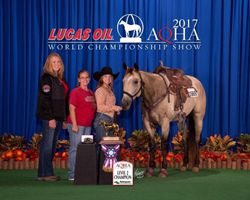 After completing her race around the barrels in the Senior Horse division, Zbytek looked up to see her time was the winning round in the AQHA Level 2 World Championships. Based out of Clewiston, Florida, Zbytek was an early user of the American Equus Xcelerate horseshoe and Elite Western Stirrups, and credits both in helping to keep her and her horse "Hanks Flyin Hope' competitive. Zbytek and her 6-year-old Quarter Horse mare, 'Hanks Flyin Hope', have been a team since the mare was just a two-year-old. Zbytek was paired with the buckskin mare, after the previous owner sent her to Zbytek's coach, Christian Caldwell, for 90 days of professional training. The pair quickly formed a strong bond and Zbytek was about to purchase her the same year. "She was my first horse that I started by myself. We started from scratch as she was only green-broke when I got her. It's definitely a lot more rewarding knowing I was able to bring her from the very beginning of her career to winning World Championships," Zbytek explained. While hard work and practice were both crucial to Zbytek's success in 2017, she also credits American Equus products as a factor in her recent success. "The Elite stirrups have definitely helped me because I don't have to worry about my feet moving or losing my stirrups ever; I love them," commented Zbytek. "Also, as soon as we put on the Xcelerate horseshoes, I could feel a big difference my mare's performance. She was immediately able to make more secure turns and because they are so light, she is able to open up and really run!" American Equus Elite Western stirrups provide unparalleled grip and style with a variety of unique colors and traction pins for each rider's individual preference, while their Xcelerate horse shoes are engineered to help horse's performance by providing superior traction and a rolled front infinity edge that encourages a faster and more correct breakover in a horse's stride. As for Zbytek's future plans, she is looking forward to qualifying in the barrel racing division for The American Rodeo Qualifier in Ft. Worth, Texas in 2018. Although she claims it is more of a challenge than anything she has done previously, she is confident she will rise to the task. To learn more about American Equus and their complete line of stirrups for all equestrian disciplines, click here.